Mouse anti Sheep MHC class II Dq DR antibody, clone 49.1 used for the detection of MHC Class II expressing cells in the nasopharynx of cattle immunized against Foot and Mouth Disease Virus by immunofluorescence. Primary infection of nasopharyngeal mucosal epithelial cells is similar in non-vaccinated and vaccinated cattle. Microscopic distribution of FMDV structural (VP1) and non-structural (3D) protein in dorsal nasopharyngeal mucosa of non-vaccinated (A-C) and vaccinated (D-F) cattle at 24 hpi. Multichannel immunofluorescent technique. A) Nasopharyngeal mucosa of non-vaccinated steer at 24 hpi (animal number 3). FMDV VP1 (red) and 3D (aqua) proteins co-localize with cytokeratin (green) in foci of primary FMDV infection in superficial layer of follicle-associated epithelium. Scarce MHC II+ cells (purple) are present in the subepithelium. 20x magnification, scale bar 50μm. B-C) 40x magnification of region identified in (A). B) Select channel combinations demonstrating co-localization of FMDV VP1(red) and FMDV 3D (aqua) with cytokeratin (green), but not with MHC II (purple) C) Merge of all images shown in (B), scale bar 25μm. D) Nasopharyngeal mucosa of vaccinated steer at 24 hpi (animal number 11). FMDV VP1 (red) and 3D (aqua) proteins co-localize with cytokeratin (green) within follicle associated epithelium. Intra-epithelial MHC II+ cells (purple) are in close proximity to virus-infected epithelial cells. 20x magnification, scale bar 50μm. E-F) 40x magnification of region identified in (D). E) Select channel combinations demonstrating FMDV VP1 (red) and 3D (aqua) colocalization with cytokeratin (green)-expressing cells and with MHC II- expressing cells (purple). E) Merge of images shown in (F), scale bar 25μm. 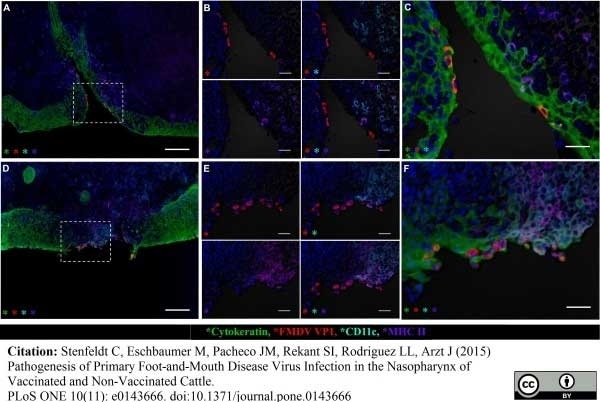 From: Stenfeldt C, Eschbaumer M, Pacheco JM, Rekant SI, Rodriguez LL, Arzt J (2015) Pathogenesis of Primary Foot-and-Mouth Disease Virus Infection in the Nasopharynx of Vaccinated and Non-Vaccinated Cattle. PLoS ONE 10(11): e0143666. 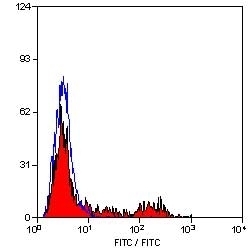 FITC conjugated Mouse anti Sheep MHC class II Dq DR antibody, clone 49.1 (MCA2228F) used for the detection of MHC Class II expressing cells in the nasopharynx of cattle immunised against Foot and Mouth Disease Virus by immunofluorescence. Differential host-virus interactions in nasopharyngeal mucosa of non-vaccinated (A-C) versus vaccinated (D-F) cattle. Multichannel immunofluorescent technique. A). FMDV VP1 (red) protein within cytokeratin+ cells (green) in epithelial crypt of the nasopharyngeal mucosa of non-vaccinated steer at 24 hpi (animal number 3). Host cells expressing MHC II (purple) and/or CD11c (aqua) are present in the subepithelial compartment and interspersed within epithelium, but without co-localizing with viral protein. 10x magnification, scale bar 100μm. B-C) 40x magnification of region identified in (A), scale bars 25μm. B) Select channel views demonstrate lack of co-localization of FMDV VP1 (red) with CD11c (aqua)/ MHC II (purple)-double positive cells. C) Merge of all images shown in (B), scale bar 25 μm. D) FMDV VP1 (red) protein co-localizes with cytokeratin (green) in an epithelial erosion in dome region of follicle-associated epithelium of nasopharyngeal mucosa of vaccinated steer at 24 hpi (animal number 11). Regionally extensive infiltration by MHC II (purple) and/or CD11c (aqua)-expressing cells co-localizing and interspersing with viral antigen.10x magnification, scale bar 100μm. E-F) 40x magnification of region identified in (D), scale bar 25μm. E) Select channels demonstrating co-localization of FMDV VP1 (red) with CD11c (aqua), MHC II (purple). F) Merge of images shown in (E), scale bar 25 μm. FITC conjugated Mouse anti Sheep MHC class II Dq DR antibody, clone 49.1 used for the detection of MHC Class II expressing cells in the nasopharynx of cattle immunized against Foot and Mouth Disease Virus by immunofluorescence. FMDV co-localizes with cytokeratin and MHCII/CD11c-expressing cells in palatine tonsil of non-vaccinated steer at 72hpi. A) FMDV VP1 (red) predominantly in cytokeratin-positive cells of epithelial crypt of palatine tonsil of non-vaccinated steer (animal number 9) during viremia and clinical FMD at 72 hpi. Abundant cells expressing MHC II (purple) and/or CD11c (aqua) interspersed with epithelial cells. 10x magnification, scale bar 100 μm. B) Select channels of image in (A). FMDV VP1 (red), cytokeratin (green), CD11c (aqua), MHC II (purple) demonstrate FMDV antigen is exclusively within epithelial compartment. C) High magnification of region identified in (A). Co-localization with FMDV VP1within subset of MHC II (purple) and/or CD11c (aqua) expressing cells within crypt epithelium (arrows in C & D). 40x magnification, scale bar 25 μm D) Individual channels of image in (B). FMDV VP1 (red), cytokeratin (green), CD11c (aqua), MHC II (purple). Mouse anti Sheep MHC class II Dq DR antibody, clone 49.1 recognizes a polymorphic epitope on ovine MHC class II DQ and DR molecules, constitutively expressed on antigen presenting cells including dendritic cells, B lymphocytes, monocytes, macrophages, activated T lymphocytes and may be induced on a range of other cell types by interferon gamma. The major histocompatibility complex (MHC) is a cluster of genes some of which are important in the immune response to infection. In sheep, this complex is referred to as the ovine leukocyte antigen (OLA) region. There are 2 major types of MHC class IIa molecules encoded by the OLA which are DR and DQ each composed of an alpha and beta chain. Mouse anti Sheep MHC class II Dq DR antibody, clone 49.1 recognizes ovine MHC II transfectants DQ - T28.1, DQ - T26.2 and DR - T31.3 but not DR - T8.1 (Ballingall et al. 1995). Use 10ul of the suggested working dilution to label 1 x 106 cells in 100ul. Puri, N.K. et al. (1987) Monoclonal antibodies to sheep MHC class I and class II molecules: biochemical characterization of three class I gene products and four distinct subpopulations of class II molecules. Vet Immunol Immunopathol. 15 (1-2): 59-86. Puri, N.K. & Brandon, M.R. (1987) Sheep MHC class II molecules. II. Identification and characterization of four distinct subsets of sheep MHC class II molecules. Puri, N.K. et al. (1987) Monoclonal antibodies to sheep MHC class II molecules recognize all HLA-D or subsets of HLA-D region products. Hum Immunol. 20 (3): 195-207. Ballingall, K.T. et al. (1995) Analysis of the fine specificities of sheep major histocompatibility complex class II-specific monoclonal antibodies using mouse L-cell transfectants. Anim Genet. 26 (2): 79-84. Kallapur, S.G. et al. (2011) Pulmonary and systemic inflammatory responses to intra-amniotic IL-1α in fetal sheep. Am J Physiol Lung Cell Mol Physiol. 301 (3): L285-95. Clin Exp Immunol. 72 (2): 274-9. Stenfeldt, C. et al. (2015) Clinical and virological dynamics of a serotype O 2010 South East Asia lineage foot-and-mouth disease virus in sheep using natural and simulated natural inoculation and exposure systems. Vet Microbiol. 178 (1-2): 50-60. Stenfeldt, C. et al. 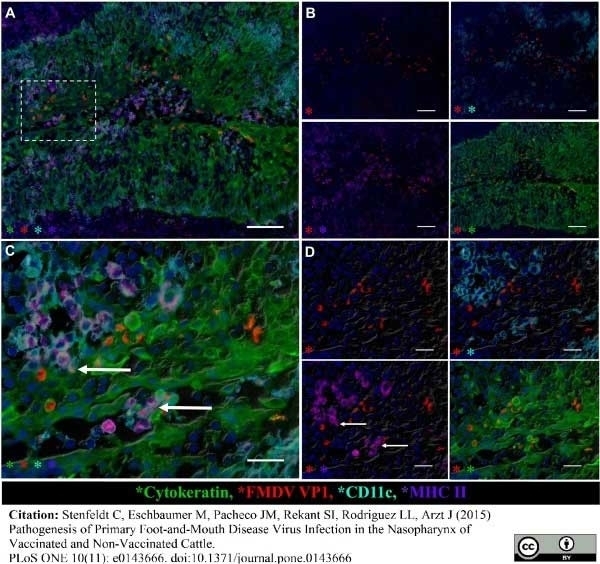 (2015) Pathogenesis of Primary Foot-and-Mouth Disease Virus Infection in the Nasopharynx of Vaccinated and Non-Vaccinated Cattle. PLoS One. 10 (11): e0143666. Stenfeldt, C. et al. (2016) The Foot-and-Mouth Disease Carrier State Divergence in Cattle. J Virol. 90 (14): 6344-64.